Finding the best drawing tablet in 2018 has been one of the most challenging tasks that the team here has had to face so far this year. Not because there is a limited amount of choice of drawing tablets (trust us, there isn’t! ), but because there are so many different factors that will determine which one is the best choice for you. Are you a working professional who needs a drawing tablet to make a living? Are you a parent who wants to encourage your child to be more creative and learn how to draw? Or are you simply an art hobbyist who enjoys drawing in your free time? Whatever your situation, there are drawing tablets to accommodate all of your requirements and budget, but which one should you choose? Luckily for you, our team have managed to review 5 of the best drawing tablets on the market, and we have done all of the hard work for you. In our opinion, the best drawing tablet is the Intuous Pro Pen ‘n’ Touch Medium Tablet from Wacom. We will explain our reasons for choosing the Pen n Touch as our favorite drawing tablet a little further into the article. Firstly, we thought it would be beneficial to explain exactly what we were looking for when testing these drawing tablets. What specifications should you, the consumer, be looking for? To conclude whether or not a drawing tablet could qualify as one of our top five, we referenced a bunch of reviews from all over the internet to find what it is exactly that makes a drawing tablet, a good choice. We also spoke with a broad range of design and animation professionals, to make sure this information came straight from the horses mouth. With features and specifications in mind, we scoured the net to find the drawing tablets that best suited our criteria, then narrowed the choice down to just five. From the research that we conducted, we found that the most important factor that you need to consider when purchasing a drawing tablet is the pen pressure level. Different tablets are equipped with a different pen pressure level. The more expensive the drawing tablet, the better the pressure levels (Typically speaking). The most common pressure levels range from 256 to 2048, but the most recent and most expensive drawing tablets have been known to promise levels of 8192. You are probably wondering what all of these numbers mean? Simply put, the pen pressure level is the scale of the width of lines that you can create by altering the pressure that you place into the pen. Draw on the tablet lightly and you will get a thin line, apply more pressure and the line gets thicker. It’s simple, really. The higher the pen pressure levels, the more receptive and responsive the graphic pad will be, allowing you to draw with a lot more accuracy and with more detail. Obviously, the type of work will determine what level of pen pressure you will require. For professional animators or graphic designers who need as much attention to detail as they can get, a high pen pressure level is crucial, especially if you are working on a high resolution tablet display. However, for the casual artist or newbie designer, you can get away with using a tablet on the lower end of the spectrum. You won’t be able to tell the difference. Ultimately, you want to choose a drawing tablet with the pen pressure level that suits your requirements. Our top pick is actually suitable for both beginners and professionals alike, and it comes equipped with a 2048 pen pressure level. If you are unsure about which one to choose, then we highly recommend you stick with this one. Pen pressure levels do not make the drawing tablet what it is. They are advanced pieces of technology with a lot going on inside of their shells. It’s important that you understand what other considerations to look out for when choosing the right one for you. If you are interested in working with air brush and shading techniques, then you will definitely require a drawing tablet with a decent level of tilt sensitivity. Tilt sensitivity is the stylus’s ability to draw thinner or thicker lines, depending on how much you tilt it. The ability to fine tune your tilt effects will be dependent upon the software that you are running on the tablet, but if you are interested in using air brush techniques in your art, then tilt sensitivity is an absolute must. The resolution will help to determine how detailed and sharp your final designs will be. Measured in lines per inch, or LPI for short, the resolution is important if you are creating art work for commerce. Graphic designers, professional animators and people who sell their artwork will require a higher resolution drawing tablet. Similar to DPI in printing, the LPI is simply a bunch of dots that make up lines across your drawing tablets screen. The closer the lines are to each other, the more detailed and sharp the image will ultimately be. It’s similar to pixels on a TV in that regard. The more there are, the better the image. The stylus is obviously a big part of the digital artwork experience, and it’s the piece of kit that spend the most time in your hands, so it’s important to take into consideration what people say about it. It’s size, comfort and built-in features are all worth taking into consideration. Depending on the type of artwork you will be creating on your display tablet, a large display and drawing surface could be a necessity. You will typically find that the more expensive the tablet is, the larger the display or the drawing surface will be. If you need a larger display to work with, then this is something you should always keep in consideration when looking for the best drawing tablet for you. After countless hours of research and speaking to the people who are in the trenches with these things on a daily basis, we came to the conclusion that the best drawing tablet is the Wacom Intuos Pro Pen and Touch Tablet (Medium). We researched drawing tablets from all price points, and we found some decent tablets for considerably cheaper than the Pen and Touch, but none are as well rounded as this one. Whatever your requirements from a drawing tablet, you will find them with this one. First of all, let’s look at the main consideration point that we mentioned earlier – The pen pressure levels. The Wacom Intuos is equipped with 2046 levels of pen pressure in not only the tip of the stylus, but also the eraser which you can find on the bottom end of the wireless pen. The built in multi-touch function allows the user to easily and quickly zoom in and out, or move the artwork around however you please. The gestures are programmable and can really help to speed up the process and make your life considerably easier. The multi-touch feature also allows the tablet to perform as a mouse, and surfing the web with your finger tips is smooth and effortless. In terms of size, the Intuos is 10 inches by 15 inches in total size, but the actual drawing area is 8.8 by 5.5 which is still a huge area to play with. The stylus is reported to be large enough to hold with a firm grip, and the design of the tablet is described as sleek, modern and stylish. If you are skimming this review to check if this tablet comes with tilt sensitivity in the stylus, you will be pleased to hear that the answer is yes! If you are looking to experiment with air brush techniques, this is definitely the tablet we would recommend to you. From reading other reviews online, it’s obvious that Wacom have gone above and beyond with this product. 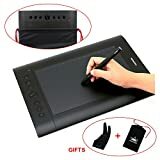 Not only are the other reviewers praising the built quality and the superior features that come with this drawing tablet, they are also surprised with the amount of accessories and extras that come along with it too. A complaint of one of the older models was that the original product didn’t come with enough nibs to last. Fortunately, Wacom have been listening to these complaints and have made sure there is enough to last you a substantial amount of time, without having to fork out $50 for some more. Overall, the Wacom Intuos Pro Pen and Touch Drawing tablet is ideal for people on all levels, and the cost is more than reasonable for the quality of product that you are receiving. You won’t be disappointed with this one. The remaining four drawing tablets are not missing out on the top spot because they are bad tablets, or because they are inferior to our top pick in every way. We chose the Wacom Intuos for the simple reason that it’s the best all-rounder and its price point is perfect for a lot of people’s budget. Each of these other four tablets have their own stand-out features and specifications. For example, the stand-out feature of the Huion H610 Pro is the fact that it’s a budget entry to this list, and for the specifications you receive for the price, you can’t grumble. If you are on a lower budget and need a quality drawing tablet that can hang with the big boys, then this one if for you. Just like our top pick, the H610 also boasts 2046 levels of pen pressure which is perfect for the perfectionists out there. The main reason why we would still recommend the Wacom Intuos, even though they have the same pen pressure levels is because there is more to a comfortable and accurate drawing experience than just pen pressure. The Huion H610 is lightweight, relatively small and easy to carry around. The drawing surface is a very respectable 10 x 6.25 inches, which is more than enough room to splurge your creativity without worrying about space. This table is extremely versatile and can be customized to suit your requirements, thanks to the 8 customizable buttons and on the side and the 16 hotkeys across the top. These buttons allow you to zoom in and out, and move around the settings of the tablet with ease. Overall, the Huion H610 Pro is the perfect drawing tablet for beginners. If you are a casual artist then this is the one for you. Third in our list we have the Cintiq 13HD from Wacom. What makes this drawing tablet unique is the fact that you get to experience what it’s like to draw directly on the screen rather than a tablet which connects up to a monitor in front of you. The 13HD has a built in 1080p HD screen which feeds back the drawing on the tablet itself, allowing you to feel closer to the drawing than ever before. The stylus is tilt sensitive and the tablet comes with 2046 levels of pen pressure. The combination of these two features, on top of the incredible response rates allows the user to pay attention to all of the minute details. The stylus itself is reported to be comfortable, sturdy and built-to-last. The 13HD has a built in three-way stand which let’s you find the most comfortable position for you to work in, and the HD screen has a wide viewing angle. You can hook the interactive display up to an external monitor, laptop or Macbook with an HDMI to mini-display port adapter. It’s compatible with both Mac and Windows, and is equipped with four programmable hot keys so you can customize the whole experience. To conclude, the Cintiq 13HD is an extremely beautiful drawing tablet with a lot of potential for experienced artists. If you need a tablet to take your skills to the next level then here is your winner. This list wouldn’t be complete without at least mentioning the Mobile Studio Pro from Wacom. As you have probably already guessed, Wacom are the industry leaders when it comes to drawing tablets, and their Studio Pro release is the most prestigious of them all. If you are looking for the crème de la crème of drawing tablets and you don’t have to take budget into consideration, this is probably the right choice for you. Admittedly, the reason we couldn’t choose this as our top pick is simply because this drawing tablet is not for the masses. It’s built for the professional animators and 3d designers of the world. Not only is this a drawing tablet, it’s a miniature PC with enough power to run all of the main graphic and 3d modeling software’s on the market. Wacom prides it’s 13HD as being 4 times more accurate than other drawing tablets with it’s lag-free response times and superior pen pressure levels. You shouldn’t expect anything less than perfection with this one. The greatest feature of the DTHW1320L is the built in display. If you thought that 1080p was impressive for a drawing table, you will be blown away by the 1440p display that the 13HD boasts. Again, this drawing tablet is probably out of budget for the majority of people reading this, but for those who need the best of the best to maximize their output and quality of work, we would not hesitate for a second to recommend this one to you. Last but not least we have the Artist22 from XP-Pen – Another top of the range drawing tablet for those who require something with a bit more oomph. The stand-out features of this XP-Pen drawing tablet are the 2046 levels of pen pressure, the ergonomic stand that can hold the tablet in a variety of different places and the 1080p, 21.5 inch IPS display with an extra wide viewing angle. Compatible with both Mac and Windows, the Artist22 is another drawing tablet that is suitable for working professionals who need a large, responsive display to get the most out of their work. Whatever software you need to run, the Artist22 will more than likely support it. This includes PhotoShop and other demanding software’s. Out of the box you will receive two free rechargeable pens and a whole host of other accessories including a screen protector and a glove. This particular product comes with a 12 month warranty, also. To round this one up, if you want something that is visually stunning and has an abundance of space to work with, this is probably the right choice for you. Before we draw this article to a close, we think it’s worth mentioning that there are no ‘losers’ in this race. Although we chose the Wacom Intuos Pro Pen and Touch as our ‘winner’ so to speak, it doesn’t take anything away from the rest of the drawing tablets in our list. The Intuos is the most well-rounded drawing tablet we have tested and combined with the affordable cost, it’s a no-brainer. We believe this drawing tablet will appeal to the majority of people reading this article, so we would be doing a disservice to you if we decided not to make it our number one recommendation. If you are looking for something that is good looking, has great responsiveness, 2048 levels of pen pressure, a good sized drawing surface area and many more features crammed into it’s small, portable body, then we highly recommend that you check this one out. Wacom DTHW1320L Mobile Studio Pro 13"
We've reviewed the Best Drawing Tablets and settled on a #1 pick. With drawing tablets, pen pressure levels can make a massive difference, find out why.